Titanfall fans, I've got some news that's either going to come across as a pleasant surprise or heretical blasphemy, and it all depends on how you feel about mobile card games. 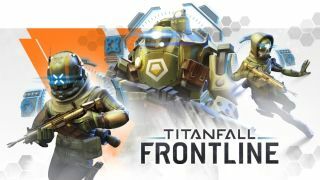 Respawn Entertainment has teamed up with Korean developer Nexon for a free-to-play mobile adaptation of the sci-fi shooter called Titanfall Frontline, and it pulls more than a few cues from Hearthstone and its ilk. In Frontline, you'll assemble a small army of cards on a playing field in front of you, with each card having an associated cost, health, and damage counter. Some cards have additional effects and/or can be upgraded. Frontline has synchronous turn-based combat, meaning players will be connected and playing the game simultaneously, with one player taking their turn followed by the opponent's turn. It sounds silly to take the fast-paced FPS action of Titanfall and squeeze it into a card game, but let's not forget that Blizzard's foray into this space is a spin-off of a franchise that had previously consisted of real-time strategy games and an MMO about humans, orcs, elves, and other fantasy races fighting epic wars and saving the world. Not so weird in context. A specific release date has not been announced (are they ever with mobile games?) but Titanfall Frontline is scheduled to drop sometime this fall. Titanfall 2, meanwhile, is slated for October 28.